Complete & compliant GDPR security policy template. A Policy Acknowledgement Form, where the user indicates he or she has read and understands the user-oriented policies. A "Getting Started" document that contains instructions on how to get the most out of your Instant GDPR Policy. Policies in Microsoft Word format, so you have the capability to edit your policies to fit your company's needs exactly. Our introductory pricing - use the promo code GDPR0010 for a 10% discount. Current Special Price: $629.10. 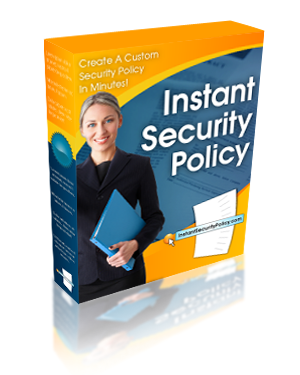 Over 175 pages of IT security policies containing hundreds of policy statements, loaded with information to share with auditors, use as an IT security manual, or set company policy. Our 30-day, 100% satisfaction guarantee. We do not think you will need to use it based on our 99.5% customer satisfaction rate, but rest assured that if you are not satisfied with your purchase we will give you your money back. Please accept my payment and immediately allow me access to my Instant GDPR Policy. You will be redirected to the main lobby. You will click a link to immediately download your policies. If you have any trouble, please contact us. * Your privacy is important to us and your contact information will never be shared or sold. Password * Please choose a password with at least six letters and numbers. Email * This is where your policies will be sent. By pressing the ORDER button, I agree to pay InstantSecurityPolicy.com. You will receive the most recent GDPR Policy Package.